The first indication I had that something might be wrong – that a potential problem was brewing – came on a beautiful fall day in 2008. I had just exited the water after a fun, two-hour surf session and was walking back along the sand toward my car when I discovered that my right ear, which had earlier become plugged with seawater, would not drain. It didn’t matter how vigorously I shook my head or how much I hopped about on one foot while simultaneously and repeatedly slapping my left temple. The ear would not unplug. I was plagued all the way home not only by the sensation of a plugged ear–which was bad enough–but also by a persistent and annoying slosh, slosh, slosh. Having been a surfer for nearly 30 years, ears plugged with salt water were nothing new. I’d suffered through them numerous times before, and they had always eventually drained. But this time something was different. When my ear didn’t drain the next day – or the next several days after that – I began to grow worried. In fact, if anything, the problem seemed to be getting worse. I was having trouble hearing and the continual sloshing in my ear was increasingly driving me nuts. Finally, after two weeks, I’d had enough. There was no point in prolonging my misery. I had come to the realization that my ear was not going to unplug itself, so I made an appointment with a local ear, nose, and throat doctor. “You have external auditory exostosis,” he told me, clicking off his otoscope and dropping it into the front pocket of his lab coat. He had just used the instrument to examine both ears. He didn’t have to explain to me what those three words meant; I already knew. And, in fact, I knew I had it because I’d been diagnosed with it several years ago. But what I didn’t know, at least at the time, was that the condition had grown exceedingly worse over the intervening years. “Your right ear is about 70 percent closed,” he went on. “What about my left?” I asked. “How come it seems to be getting worse?” I asked. I didn’t find his paleontological allusion particularly humorous, and I sat for a moment, staring glumly at the opposite wall. For those of you who are right about now asking, “what the hell is auditory exostosis?” let me explain. Otherwise known as “surfer’s ear,” external auditory exostosis (EAE) is a condition of the ear canal whereby bony, knob-like growths form and, given enough time, gradually close off the eardrum. These bone growths are called exostoses and are the body’s way of protecting the ear from prolonged or repeated exposure to cold water and wind. Although the condition is generally considered benign, it can lead to chronic ear infections, equilibrium problems, and, eventually, hearing loss if left untreated. What happens is this: The bony lining of the ear canal becomes irritated by long-term exposure to cold water and wind, which triggers an overproduction of the bony substance under the lining of the ear canal. This bony substance forms in overlapping, concentric layers, which slowly but surely build up over time and eventually protrude into the external auditory canal, like stalactites and stalagmites. Surfers, of course, aren’t the only individuals who are susceptible to exostosis. Anyone involved in activities where wet, cold, and windy conditions are prevalent can get EAE. Divers, kayakers, windsurfers and even sailors, for example, have been known to develop the condition. My face immediately dropped. I’d heard of the procedure before, of course, and knew what it entailed. In the most extreme cases, an incision was made at the back of the ear, and the ear was folded forward like a thick slice of prosciutto. A surgical drill was then inserted into the incision and used to bore – yes, bore – into the ear canal, thereby removing the offending bone growth. Just the fact that a high-powered drill was involved – and would be boring into the very delicate bones of the ear canal – was enough to make a chill run up my spine. Utmost care and precision were used in the procedure, of course, so as to avoid damaging the skin of the incredibly thin ear canal, but as the saying goes, “accidents do occur.” Altogether, it was expensive, painful and, importantly for surfers, kept one of the water for several months. He went on to explain that this new, less invasive technique, pioneered by Santa Cruz doctor Douglas Hetzler, was revolutionizing how EAE was treated. Instead of a drill, this new technique involved using a very tiny chisel and mallet to chip away at the exostoses. These tiny instruments – measured in millimeters – enter directly through the ear canal rather than the back of the ear. The skin covering the exostoses is carefully peeled back and the chisel is then used to scrape away the exposed knobs. No incisions were made, no flaps of ear manipulated like slices of deli meat and, most importantly, no drilling was involved. According to Dr. Hetzler, the drill can tear up the skin, which can dramatically slow down the healing process, and carries the risk of inflicting potential nerve damage. Over the next several days – while waiting very impatiently for my ear to drain – I scoured the internet, reading up on everything I could find about the chisel technique. At first glance, it seemed almost comical. Using a tiny mallet and chisel to chip away at the knob-like growths brought to mind images of that scene in Snow White and the Seven Dwarfs where the dwarves are busily excavating in their diamond mine, hacking away at the walls with their picks and axes. Still, the medical establishment had pronounced the procedure a wholly legitimate technique in treating the condition. In fact, the technique had become increasingly popular over the last several years, with more and more surgeons adopting it over drilling. Dr. Hetzler suggests that perhaps the best way of preventing or at least slowing the growth of ear exostoses, short of quitting surfing (an impossibility, of course), is to wear earplugs and a neoprene hood or cap. He suggests that these, worn in conjunction with one another, provide the best means of combating the problem and helping the ear canal to stay warm and dry. Given my obsessive personality, my reading expanded from learning about all the intricacies of the medical procedures involved in treating EAE to a broader understanding of the condition. And I was able to glean some interesting facts. I learned, unsurprisingly, that EAE is more prevalent in cold water surfers, especially those who are repeatedly exposed to water colder than approximately 65° F. The number of years surfed is significant in increasing one’s risk of developing exostoses. In other words, the more time one spends in cold water, the greater the likelihood of developing EAE. That’s why most patients develop the condition in their mid-to-late 30s, though there have been cases of people in their 20s developing it as well. In perhaps the most definitive clinical study yet conducted on the subject, researchers studied a group of Oregon surfers in order to ascertain the cold water exposure necessary to produce exostoses. They found that individuals who surf 5 years or less (in water below 65° F) are unlikely to develop exostoses unless they are surfing greater than 50 sessions per year. Dr. Hetzler has suggested a different way of looking at essentially this same statistic. He argues that an individual who has spent approximately 3,000 hours in water colder than 65° F can expect to develop exostoses of sufficient degree to cause a significant narrowing of the ear canal. I ran across other intriguing facts as I continued my internet research. I learned, for example, that EAE is by no means a recent phenomenon; it is, in fact, a medical condition with a long historical pedigree. Several pre-Columbian populations in coastal Chile and Peru, for instance, demonstrate evidence of EAE. One study, which analyzed more than 700 skulls from several archaeological sites in coastal southern Peru that dated back more than 8,000 years, showed a high prevalence of the condition among the male population. Evidence of EAE has also been found in pre-Columbian populations in North America, especially among certain Native Californian groups. At an archaeological site on San Clemente Island, one of the eight Channel Islands off the coast of southern California, a sample of human skulls yielded numerous examples of EAE. The researchers also noticed large quantities of abalone shells at the site. Putting two and two together, they tentatively concluded that the presence of EAE was likely the result of a lifetime spent harvesting these large aquatic snails – a task that required diving in the cold waters off the island. Perhaps most amazing of all was evidence of EAE in human skull fossils dating back to approximately 250,000 years – the time period of the earliest Homo sapiens. All this information was probably more than I needed to know, but it did help me decide what to do about my ear. I didn’t want to end up like one of those Peruvian mummies – slowly going deaf without recourse to modern, technologically advanced medicine. So I opted for Dr. Hetzler and his chisel technique. On the day of my operation it was cold, overcast, and drizzly. I hoped this wasn’t an omen of things to come. But when I saw Dr. Hetzler prior to the operation he was friendly and cheery. This immediately put me at ease. I wish I could say I remembered something about the operation – at least for reporting purposes – but to be honest, I have no recollection of it whatsoever. I was under general anesthesia for the duration, and didn’t awaken until several hours later. By then I was lying in a hospital bed with my ear bandaged, heavily looped on Vicodin, with the offending exostoses having been reduced to tiny chips of their former selves and placed in a plastic vial by my bedside. As the haze gradually cleared, I noticed my girlfriend, Lauren, sitting next to me. She had a distinct frown on her face. “How’d the operation go?” I croaked groggily, trying to sit up. “Huh?” I stared at her in dismay, absolutely clueless, trying to figure out the reason for her sudden outburst of hostility. Apparently, as Lauren was later to tell me, I had spent the last half hour in a continuous cycle of waking up abruptly, asking about the success of the operation, and then, without waiting for an answer, promptly falling back asleep. So, by the tenth time, Lauren was understandably exasperated – hence the hostility. Luckily, she didn’t stay mad very long and drove me home, gave me another vicodin, and put me to bed. My convalescence was blessedly complication-free, with my right ear improving daily. By the end of the month I was eager to get back in the water. And, indeed, after the requisite 4-6 weeks of healing time, Dr. Hetzler gave me the go-ahead. 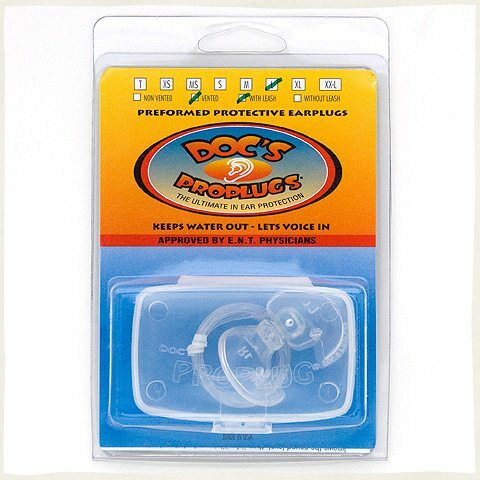 Instead of running to the beach, however, one of the first things I did was make a bee-line to my local surf shop, where I plopped down twelve bucks for a pair of Doc’s Proplugs – rubber ear plugs specially designed to prevent surfer’s ear. I have surfer’s ear and need surgery. I’m looking for a doctor in NY that performs this surgery. I live about 1 hour north of Manhattan in NY. Anyone know a Doctor in this area? Great article. I had the old fold ear forward op last year, (1 ear only)the doc said only way due to being so badly blocked. I now use Blu-Tac, a big ball of it and can successfully stop all water entering the ear. I hope this will help prevent it from reoccuring. I know stress about my kids being so young and learning to surf, I must get them to wear ear plugs I think. Anyway have you done any follow ups on whether the plugs are working. I really don’t want to go thru the op again. And to the bloke who was going to India, how did you go? Man risky move, one slip of the drill and there goes the nerve to the face. Lose that and you can have a permanent droopy face, I feel for the people who had that happen. Excellent question. Wow, I had no idea surgeons in India do this procedure! Anyway, to answer your question, it took surprising less time than I assumed. I was back in the water a little over a month after the surgery. Of course, if you get the old-style surgery (i.e., the drill) it takes much longer. In short, I was really happy with the surgery and had no post-surgery complications. The ear healed quite nicely and wasn’t very painful. Good luck! Many thanks for the article mate, lots of good info there. I’m thinking of getting this procedure done in India early next year and then going travelling afterward, but not too sure of the recovery times involved. How long did it take yours to heal enough to be out and about with the pain gone? Thanks for dropping me a line! Sorry to hear about your ear problems. Sounds pretty horrible. Gosh, I hate to disappoint you, but I’m afraid I haven’t a clue about the kind of surgery you describe. As I mention in the article, Dr. Douglas Hetzler up here in Santa Cruz did my surgery. I’m afraid I’m not familiar with any ear surgeons down in So Cal. But you might want to give Dr. Hetzler’s office (831-458-6272) a call and ask about referrals. I’m assuming he would know about a competent doctor down there. I’m afraid I don’t know who did Long’s surgery, but you’re right, I’m sure he was undoubtedly the best! Thanks again, and I hope you’re able to work out your problem. Frankly, I’ve never heard of BluTac, so I can’t really say whether it’s any good, though it sounds like a reasonable advice to use, as long as it doesn’t hurt your ear. Best to ask an ear doctor. Anyway, to answer your specific question, I’m not sure there is any way to prevent at least some water in your ear during a surf session. I wear Doc’s Proplugs and a hood, and even with both of these, some water still gets in my ear. I’m not sure there’s any device that would completely prevent water from entering your ear canal. I’m also assuming that some water is probably okay. The best we can do is slow the process of exostosis formation down, probably not eliminate it. Thanks for your question. i asked a couple of local surfers here about surfer’s ears, and some said BluTac was the best to prevent it! So I got some, take a couple of chunks of it and shape it like a grossly made needle, then stick it in my ears (by pushing on it and squeezing it). It definitely feels like my ears are blocked (can hear myself breathe etc), and not cold, however I still feel like there is a tiny bit of water in my ears while I surf. Does it sound like it’s good enough, or should I better keep my ears 100% dry? This doctor seems to be very good with minimal invasive surgery. Very good question. I didn’t run across any references to vertigo as a symptom in EAE cases, nor did I personally experience anything like vertigo or dizziness. But it stands to reason that it might be a possible symptom. My guess is, though, because EAE is a condition of the external auditory canal rather than the inner ear, EAE in all likelihood wouldn’t cause vertigo or dizziness. Although I’m certainly not a doctor, it seems to me that unless the otolith bones (the utricle and saccule) of the inner ear are affected, vertigo and vertigo-like symptoms probably wouldn’t manifest. But I could be wrong. Anyway, thanks for your question! In your research, did you come across any relation of EAE to vertigo? This is very consistent to what has happened in my life except I have never had surgery and I still suffer to this day! I am 50 years old now and as amazing as it sounds I got use to the ringing in my ears even as I type this, My ears are ringing away! I was recomended to have surgery when I was 40 I had 85% closure to both ears back then and who knows what it is now? Unfortunately I could not afford the surgery. All I know is I have to ask alot of people all the time what they said because I did not hear them well. Anyways this was a good article to read and maybe someday I will get the surgery or just go deaf like I have been doing so far. I wish I could afford to get the surgery, But in this economy I just cant!